Zulu - In the Jungle from Ian Kenton on Vimeo. Singing Workshop and Performance with Singing for Pleasure Choir, Otley, UK. Rodillian Academy Music sessions for the Rodillian Festival, Wakefield, WF3 3PS. Henley Rugby Football Club, Dry Leas, Marlow Road, Henley on Thames, RG9 2JA. Tonicha Lawrence Academy Dance Showcase, 92 The Avenue, TLA, Gateways School, Leeds, LS17 9LD. Live performance at The Arrivals and Departures Project, in Leeds, UK. Singing for Pleasure Choir, Performance & singing workshops in Otley, UK. 06 & 13 Dec 2018: O.A.O.P. Sing for Pleasure Choir, Otley Labour Rooms, 01 Nelson Street, Otley, LS21 1EZ. 08 Dec 2018: Tonicha Lawrence Academy Anniversary Show, 92 The Avenue, Leeds, LS17 9LD. 16 Dec 2018: Vologee Christmas Fuddle, Eiger Studios, Farfield House, New Craven Gate, Leeds, LS11 5NF. 18 or 19 Dec 2018: O.A.O.P. Christmas Show, Otley Labour Rooms, 01 Nelson Street, Otley, LS21 1EZ. 27 & 28 Dec: Ubunye Rehearsal and Songwriting Session, Leeds, UK. 10, 17, 24 & 31 Jan 2019: O.A.O.P. Sing for Pleasure Choir, Otley Labour Rooms, 01 Nelson Street, Otley, LS21 1EZ. 13 Jan 2019: Live at Northwrite, UK. Venue and other details to follow. From KwaZulu Natal to the world's stage, rekindling the spark of Zulu culture and heritage through traditional drama, song and dance. 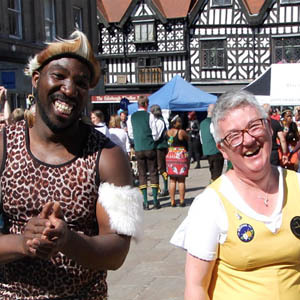 Zulu Tradition at Shrewsbury Morris' Beats and Bells in June 2015. A good time was had by all. The town was buzzing with it! Imagine a youthful, mixed gender, Ladysmith Black Mambazo with high kicks. 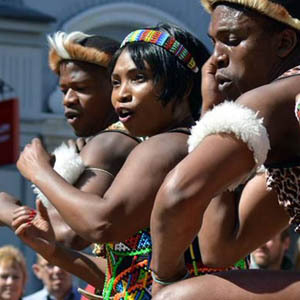 ZULU is company of genuine young Zulu singers and dancers who deliver a heady mix of African harmonies (traditional songs as well as Afro-Gospel) and high-energy, athletic dance - all traditionally costumed and with drum-rhythms. Their stage shows are exciting, enthralling and hugely entertaining and they attract enthusiastic audiences. 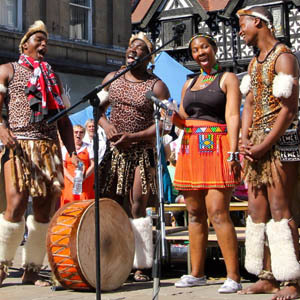 Some of the members of Zulu Tradition are also part of the Zulu/English jazz fusion group Ubunye, based in Leeds. 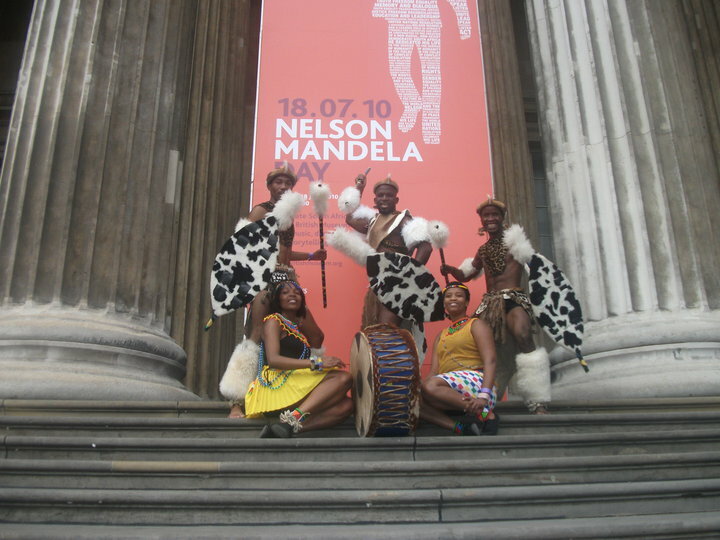 "Just wanted to say a big thank you to the Zulu stars for their wonderful performances for the public during Mandela Day at the British Museum. Many thanks especially for being so generous with theirr time toallow the visitors to be photographed with them." - Hilary Williams, The British Museum, London. This vibrant company of Zulus reaches back into the past to preserves ancient skills while stretching forwards to contemporary Africa. 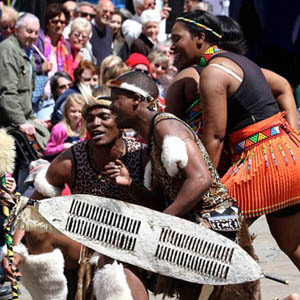 Direct from Durban in KwaZulu Natal, individual members of ZULU have performed in the UK and abroad, including special events at Buckingham Palace for Prince Charles, at the South African High Commission as well as at major festivals across the UK. They hit national TV in both the UK and in South Africa when performing for the first officially sanctioned Mandela Day at the British Museum. They are not only great concert performers, but also excellent communicators who can deliver outdoor performances for special events, festivals, summer-seasons, galas. During term-time they offer a range of educational workshops for young people of all ages and abilities. They excel in daytime outdoor performances for special events, festivals, summer-seasons, galas (and weddings). They also play festival, theatre and arts centre concerts. During term-time they offer a range of educational workshops for young people of all ages and abilities and do workshop days in schools all over the country. 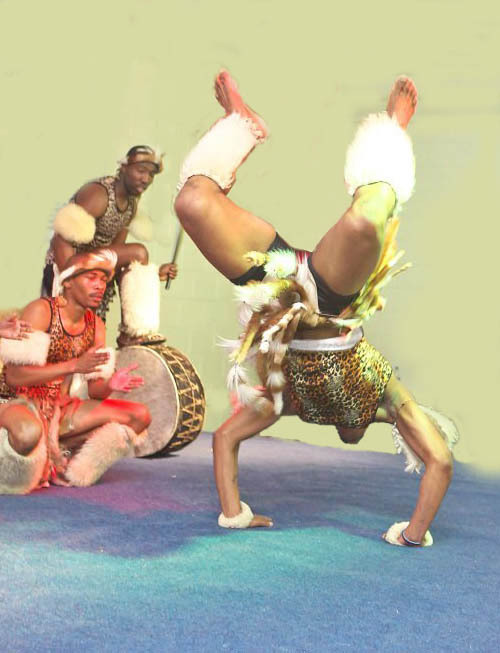 A typical show from ZULU encompasses: Maskandi (indigenous Zulu music as well as traditional song & dance including Zulu psalms (AMAHUBO); traditional songs (AMACULO ESINTU); and various genres of traditional dance (i.e. iINGOMA, UMZANSI, ISIGENYANE, NENDLAMU). They place great value on the oral relaying of information from the older generation to the youngest (UKUTHAMUNDWA). ZULU Tradition , is also an educational company grounded firmly in the curriculum of Africa's rich history and the established paradigms of Zulu philosophy. ZULU Tradition have performed at venues and events including: Buckingham Palace, the British Museum for Mandela Day, The South African High Commission for the British Red Cross, Sidmouth International Festival, Wickam Festival (Hampshire), Saltburn Folk Festival, Derby Tradition Festival, Sunderland Festival, Birdsedge Village Festival, Wallingford Festival, Towersey Festival (Oxon), Broadstairs Folk Week, the Platform Morecambe, the Georgian Theatre Royal in Richmond, The Junction, Goole, Landmark Arts Teddington, Mill Arts in Banbury, the Square Chapel Arts in Halifax, The Old Laundry Theatre, Bowness, plus community concerts for Night Out scheme in Wales, Live and Local in Derbyshire and Staffordshire and the Shindig touring Scheme in Worcestershire. 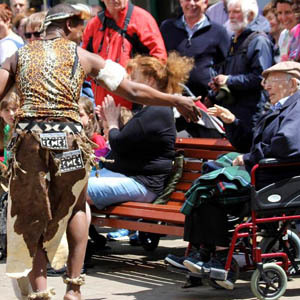 Individually the Zulus are hugely talented, right across the spectrum of traditional entertainment, though each has their own particular strengths in drumming, dance, song, drama, choreography or musical arrangement. 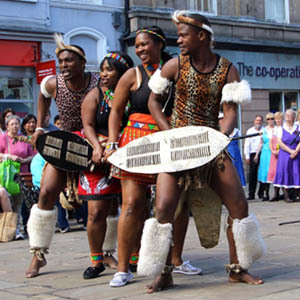 Despite their extensive work at outdoor events during the warmer weather, the performers of ZULU Tradition are no stangers to the big concert stage. They have taken their Zulu culture to many audiences. Individually and collectively they have graced many stages from London to Moscow as significant parts of larger productions as well as a company in their own right.